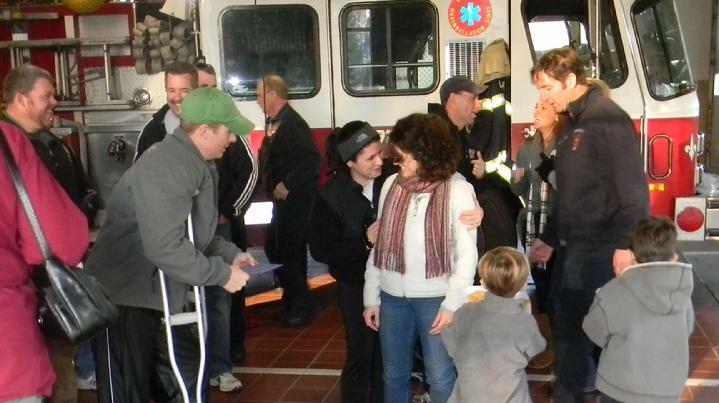 Lt Kowalski is greeted at Beverly Fire Headquarters by friends and family. The Beverly Fire Department would like to welcome home Lt. Matthew Kowalski. Matt, a Staff Sergeant in the Army National Guard, was injured in Afghanistan. All of us are proud of Matt for his dedicated service and look forward to his return to the Department after a speedy recovery. Beverly Firefighters took advantage of the empty �A� house of the old Beverly High School in order to practice skills that are vital to insuring that all firefighters make it off the fireground safely at the end of the day. Crews conducted several evolutions with increasing difficulty that all began with a downed firefighter and ended with the firefighter being rescued by the Rapid Intervention Teams. Rapid Intervention Teams (RIT) are special rescue teams designated at every working fire. Their sole purpose is to be at the ready outside a burning building just in case a firefighter gets into trouble inside the building. Although RIT is not new to the fire service, it has evolved throughout the years as a result of different experiences that were both good and bad in nature. The fact of the matter is that when a Rapid Intervention Team is placed in service, something has gone drastically wrong and the odds of a completely successful intervention are only 25%. Today�s final scenario began with a firefighter declaring a MAYDAY after falling through the roof during ventilation operations. The 1st RIT made its way to the victim and quickly identified a second trapped firefighter. With the assistance of a second crew, all firefighters were safely evacuated from the structure. All of the rescue firefighters wear a mask that prevents them from seeing while conducting the operation. The loss of this very important sense adds realism to the scenario and challenges firefighters to be able to manipulate all of their gear solely by touch through a hand with a heavy glove. By practicing new techniques and reinforcing basic skills, firefighters are giving themselves the best chance of survival. Everything in a RIT operation needs to be automatic, it isn�t a time to be uncomfortable with equipment or unfamiliar with search techniques. Today�s drills challenged all of the firefighters involved but also instilled confidence that when things go terribly wrong, they will be able to make them right. After several years in service with the Beverly Fire Department, Fire Boat 1 has been taken out of the water for the final time. Fire Boat 1, a 24 foot Rigid Hull Inflatable Boat (RHIB) has provided the Beverly Fire Department with a means of responding to open ocean emergencies since 2002. At the time, the Coast Guard hand me down proved to be a tremendous improvement over the 14 foot Boston Whaler that was in service at the time. The RHIB was bigger and faster the Whaler making firefighters jobs easier. Unfortunately, the boat did little to provide additional safety for firefighters and required constant maintenance to aging parts. Admittedly, the cost of the boat made purchasing a dedicated Fire Rescue Boat impossible in the past. At a cost of more than $350,000, the City could not afford to make the purchase on its own. The solution for that came with a 2009 American Reinvestment and Recovery Act Grant for Port Security. The grant fully funded the project for the Department. Firefighters are looking forward to getting the new boat in service. Marine 1 will provide firefighters with a multitude of improvements over Fire Boat 1.